When asking how to cook a steak, you can expect a wide variety of answers. The term “steak” covers many different steaks from the tough round steak to the tenderness of the tenderloin. When cooking steak recipes which are by dry heat cooking, there is no tenderizing done by this method. This method could include dry heat roasting, broiling, grilling, pan frying or pan broiling. Since none of these methods do any tenderizing during cooking, the steak must be of a good tender cut or tenderized well before cooking. DRY HEAT ROASTING is done in the oven with circulating air. The steak is placed in a shallow open pan without any liquid. BROILING AND GRILLING is cooking by direct heat over charcoal, gas burner or under electric unit. PAN BROILING is placing the meat in a heavy skillet, uncovered without fat or liquid. This is good for thinly cut steaks. The cooking is done slowly. PAN FRYING is similar to pan broiling with the addition of some kind of fat. MOIST HEAT COOKING is primarily for the tougher cuts of steak. With these techniques, the meat can be coated with flour and browned in a little fat. For BRAISING take this meat in the skillet, cover with a lid and allow steam to form. Cook slowly until steak is tender. SIMMERING OR STEWING is placing this browned steak in a skillet, add a little water, cover and cook slowly until tender. Knowing how to cook a steak also means know how to identify the quality of the steak. The most tender and the most expensive of the steaks come from the loin. These include the sirloin, porterhouse and top loin steaks. The round portion of the steaks, which include top round, eye round, bottom round and tip steaks are not as tender and must be marinated for dry heat cooking or cooked by moist heat. Steaks from the chuck are not suited at all for dry heat cooking. These steaks are the chuck, arm shoulder and blade. It is important to know how to cook a steak. Below is a list of steaks and how they can be cooked. Below is a general timetable for how to cook a steak. 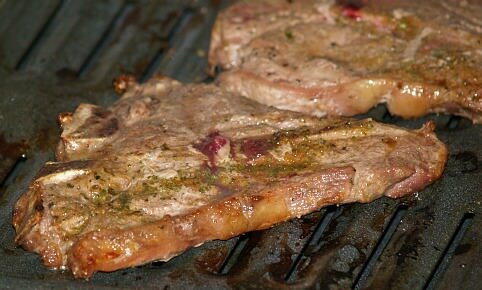 Tips are always helpful when learning how to cook steak like choosing steaks that have little speckles of fat through the meat. This little fat will melt away but add juiciness and flavor to your final product. If a lot of fat is around the steak, trim some of it off. If you like your steak cooked “rare” buy it about 2 inches thick and make sure it is cut evenly. Don’t salt the steak before cooking. It will draw out the juices and make the meat tougher. When you learn how to cook a steak you will find lots of recipes for cubed steak. This type of steak needs longer slower cooking for tenderizing. Preheat oven to 325F degrees; place steak in greased roasting pan. Combine and mix can soup, wine and onion mix; pour over meat. Cover and bake 3 hours (Check so pan doesn’t dry, add water if needed). Serve with rice, noodles or mashed potatoes; serves 4. When you learn how to cook a steak, you will find this to be real “Southern comfort food”. Combine flour, salt and pepper; set aside. Combine and blend eggs with water; set aside. Dredge steaks in flour mixture; dip in egg mixture and then dredge in breadcrumbs. Melt butter in a large skillet over medium high heat; add steaks to skillet. Fry steaks 10 minutes turning over 1 time; top with white gravy to serve. Melt butter in heavy saucepan over low heat; stir in flour until smooth. Gradually stir in milk; cook and stir over medium heat until thickened and bubbly. Season with salt and pepper; serve hot. Learn how to cook a steak on the grill with green peppercorn sauce. You can also broil these in the oven. Combine port wine, red wine, Worcestershire sauce and peppercorns in a small saucepan. Bring mixture to a boil; reduce heat, simmer uncovered 5 minutes and set aside. Coat grill rack with cooking spray (or broiler pan); place over medium hot coals (350F to 400F degrees). Grill 5 minutes on each side or until desired doneness basting frequently with ¾ cup of the sauce. Serve steaks with remaining sauce; serves 6.